The Browns chose Freddie Kitchens as their next head coach on Wednesday, temporarily leaving interim head coach Gregg Williams in limbo. That’s no longer the case, as Williams is out in Cleveland and will not return, sources tell Pat McManamon and Dan Graziano of ESPN.com (on Twitter). Williams is a highly-respected defensive mind, but the Browns will go with a new staff on that side of the ball as Kitchens puts the bulk of his focus on the offense. 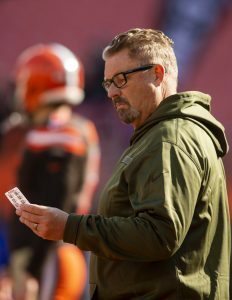 It’s not clear whether the Browns entertained bringing Williams back as their defensive coordinator (which was his role before the in-season firing of Hue Jackson), but in any case, it’s unlikely that Williams was interested in a role reversal with his former assistant. The Browns went 5-3 under Williams in the second half, but the Browns are putting more stock into Kitchens’ impact on the offense than Williams’ defensive management or leadership. At this stage of the coaching cycle, it’s unlikely that Williams will garner consideration for the remaining head coaching vacancies, but he should be a top candidate for open DC jobs. Ok, Steelers. Your move now. It’s way past time to kick incompetent Keith Butler to the curb and hire Williams as DC. If Butler stays, well then good luck Tomlin, when your contract is “not renewed” after the 2019 season. Yeah, whoever hires him can enjoy having his 30th ranked defense. Cleveland’s improvement during the year was a lot more about getting that offense in gear than anything Williams did, I agree. Terrible decision. Williams did great. Go to the raiders. Better than the one the have there now. Need to get rid of the bum head coach first. Attention Andy Reid! Hire this guy NOW! yes yes yes!!! hes a local guy that could turn our defense around.